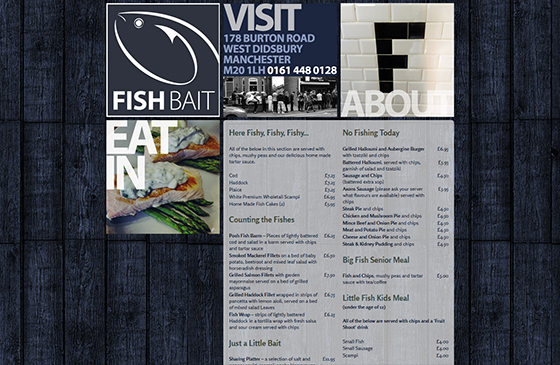 When Faye took over Frankie’s Fish Bar in West Didsbury, she did her homework about who she wanted to work with on her website. The guys at Frankies were very complimentary about the work we’d done for them, but she also investigated other projects we’d been involved in and spoke to people too. We like this, because it means potential clients are serious. They’re prepared to do a bit of homework and that usual means they make the right choice. It also means that they’ve already found out we don’t have set rate cards, or use templates or pass clients over to account managers once they’ve signed on the dotted line or paid a deposit. We had to be inventive when it came to photography for the site, as a full on photo shoot was out of the question – and not totally necessary for the style of design we were going for. We wanted a site that was a bit quirky, a bit edgy – a bit less your usual fish & chips shop website and we felt that an iphone & the instagram app would suit this look perfectly. Judge for yourself, but it seemed to work a treat. Rather than adding to the cost by building a bespoke gallery, we added a link to the Pinterest account we created. Again, perfect for a busy business who can literally just whack in their own images as and when they like. 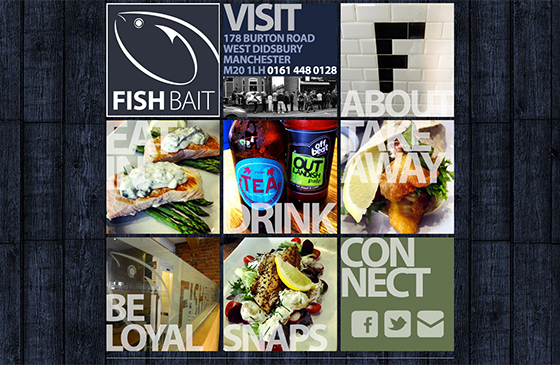 Fish Bait Fish Bar is located on Burton Road, West Didsbury.